Michele Nagamine, a townhome owner at Moana Kai in Hawaii Kai, has known all along that there could be a condominium next door someday. She just wasn't prepared for a condominium that would be 90 feet tall. But that is just what the developer, 21st Century Homes, is planning on if the city grants it a zone change. Under current rules, Hale Alii, a $200 million luxury condominium slated for a 3.5-acre site at the corner of Keahole Street and Hawaii Kai Drive, can build up to only 60 feet. Mike Klein, marketing manager for 21st Century Homes, said the company now envisions two 90-foot buildings with 297 condos on the site, one of the last remaining developable parcels in Hawaii Kai. Nagamine would lose her view, but she says that's not the important thing. "I don't care about the view," she said. "It's the quality of life. That building will virtually block out all the sunshine and trade winds. What we want is for them to build something more conducive to the look and feel of the rest of the community." Klein, a major shareholder, and his partner, Joe Brown, are pushing for the taller height, which would allow a 10-story complex instead of a 7-story one. Going higher would mean better view channels, and units would therefore command higher prices. The number of units would remain the same. "This is a landmark site," said Klein. "You're going to have a much better-looking product as you drive down the road. It adds a heck of a lot more pizzazz." The project as envisioned would feature tiered buildings, a courtyard, underground parking, waterfalls and a putting green. It would be aimed at the high-end luxury market, on par with the Hokua in Kakaako. Klein is also the founder of a non-profit group which developed Kaluanui Senior Apartments in Hawaii Kai several years ago. While the original intention was to create more senior homes, those plans changed as construction costs skyrocketed. Now the plan is to go high-end, with two- and three-bedroom condos priced at $800,000 to $1 million and above. At least 100 units, and possibly more as required by an agreement with the city, would be set aside as affordable rentals, with minimum 10-year leases. The height limits allowed on Hawaii Kai Drive have gone up and down. At the time that 21st Century bought the site in 2000, the height limit was 150 feet. A handful of high-rise condos, most of them built in the 1970s, are lined up against the mountain on the drive. In 2002, the city reduced the height to 60 feet in response to community concerns. 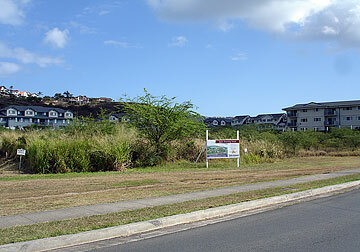 Thus, driving mauka, the skyline is lower, with new townhome projects like D.R. Horton Schuler Division's Moana Kai and Nanea Kai. Now the Honolulu City Council would need to approve 21st Century's request for a zone change to increase the height limit after review by the planning commission. A vote could take place in April or May. Some community groups and neighbors, meanwhile, are vocally opposed to the height change. 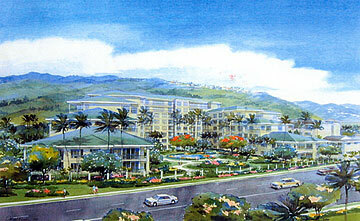 Klein said buyers at Nanea Kai and Moana Kai agreed upon buying their units that there were no protected viewplanes. Nagamine, however, says she feels misled on how high and close it the neighboring project could be. Bruce Schneider, president of the Moana Kai Homeowners Association, said if Hale Alii is built as now conceived, the townhomes would be pinned between a 90-foot tall building and a mountain. "There's a big difference between 60 feet and 90 feet," said Schneider. "The 90-foot building would cast a much larger shadow. We'd all rather see a townhouse development." Wayne Levy, a neighborhood board member said he thinks overall, Hawaii Kai is already overdeveloped and crowded. "Personally, my commute has gotten a lot worse," said Levy. "I think it's a bad policy to give them an exception to go higher. ... You don't have to take the maximum use of what the zoning allows, and we don't have to let them." Elizabeth Reilly, president of the Livable Hawaii Kai Hui, and who also sits on the neighborhood board, said she opposes "spot zoning," which could potentially lead to more developers doing the same. Another neighborhood board member, Bob Clark, supports the project. "It's perfectly acceptable," said Clark, who voted in favor of it in 2004. "We in fact pushed the developer to design it the way he's done, so we wouldn't have something like the D.R Horton development right up to the street." With or without the additional height, Klein said the developers plan to move forward. If they can't build higher, they may go more horizontal, with some design changes. 21st Century Homes hopes to begin sales this summer, and break ground by the end of the year.